There are some legal aspects of the charges against Judge Kavanaugh that are being left out of the discussion. 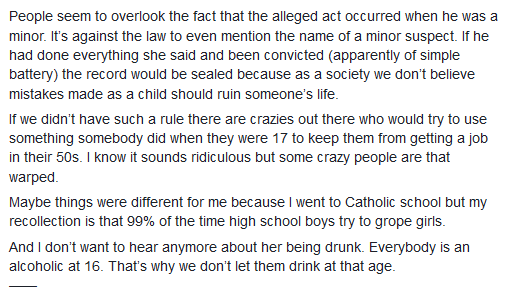 A lawyer friend of mine posted a few comments on the subject on Facebook: CNS News posted an article about the attempts to give the accused a chance to face his accuser. Senate Majority Leader Mitch McConnell (R-Ky.) told a news conference Tuesday that Judge Brett Kavanaugh’s accuser “certainly does deserve a right to be heard,” but at the same time, he called it “disturbing” that Democrats decided to withhold her accusation until the last minute. Later, an attorney for the accuser, told CNN’s Anderson Cooper her client “is prepared to cooperate with the committee” — but not on Monday, and not until the FBI does a full investigation. “There shouldn’t be a rush to a hearing,” attorney Lisa Banks said. The FBI has already done extensive background checks on Judge Kavanaugh for his previous positions. None of these charges have ever surfaced. Now, when the Committee was ready to vote, the accuser comes forward, not remembering the year, the place, or how she got home. There is also a discrepancy between what she told her therapist and what she is saying now (four boys in the room instead of two boys in the room). The whole thing looks like a delay tactic. It is also really scummy to bring forth a thirty-five-year-old charge that cannot be proven one way or the other. The accuser has also refused to appear before Congress to confront Judge Kavanaugh until an FBI investigation has been conducted. There is no way the FBI can investigate a thirty-five-year-old charge where the accuser doesn’t know what year it was, where it was, and is fuzzy on the details. That is ridiculous. Ranking Member Feinstein first received a letter with allegations against Judge Brett Kavanaugh from Dr. Ford in July. However, Feinstein neglected to notify Committee Republicans of the letter until the day of the first Committee markup, six weeks after receiving the letter and well after the vetting and hearing process had concluded. Feinstein referred the letter to the FBI, which added it to Kavanaugh’s background investigation file. She should have treated these allegations seriously, as Grassley has done, in immediately acting upon hearing of them. The FBI has indicated to the committee and in public statements that it considers the matter closed. The FBI does not make credibility determinations. The FBI provides information on a confidential basis in order for decision makers to determine an individual’s suitability. The Senate has the information it needs to follow up with witnesses and gather and assess the relevant evidence. Grassley’s staff has sought to work with the Democratic staff to reach out to relevant witnesses. The Democratic staff declined to participate in a follow-up call with Judge Kavanaugh Monday regarding these allegations. And they have declined to join efforts to conduct a bipartisan investigation of the allegations. I have a few observations. I know the Republicans are afraid that if they move forward, they will lose the women’s vote in the mid-terms. I have a word for the Republicans. As many women can identify with the idea of a woman coming forward with a career-destroying accusation against their husband thirty-five years later as can identify with the accuser. If the Republicans do not move forward with the vote immediately, they will lose more votes in the mid-term than they gain. Radical feminists are not going to vote Republican anyway, and they are the only women who ascribe any credibility to this charade. Republicans, this is your moment–either you have a spine or you don’t. If you don’t, you will lose more votes than you will gain. Robert Bork would have made a fantastic Supreme Court judge. He was brilliant and understood the U.S. Constitution. Unfortunately he was blocked from being a Supreme Court Justice because of the antics of that bastion of virtue Ted Kennedy. A similar tactic was tried on Justice Thomas, but it didn’t work. Justice Thomas, thankfully, sits on the Supreme Court. Now the attempt is being make to prevent Judge Kavanaugh from being confirmed. It is an ugly attempt, and hopefully it will fail. …Strassel went on to question whether a letter concerning enough to warrant a federal investigation should have been shared with Senate Republicans, who, just like their Democratic counterparts, were charged to “advise and consent” with regard to Kavanaugh’s nomination. Additionally, she suggested that if the accuser had explicitly stated a request to not take things further, Feinstein could be betraying that trust by going to the FBI. …Finally, Strassel argued that the timing of the letter’s introduction into public discourse “cannot be ignored” — it was made public only after Senate Democrats made numerous attempts to stall or delay Kavanaugh’s hearings, all of which were shut down. Approval of nominees is supposed to be based on the qualifications of the nominee. Unfortunately in recent years, it has become extremely political. I firmly believe that barring unusual circumstances, a President is entitled to appoint the people he chooses. That courtesy was extended to President Obama, who appointed Sonia Sotomayor and Elena Kagan to the Supreme Court. The appointment of Merrick Garland was blocked according to the ‘Biden Rule’ put in place under George W. Bush. The Democrats invented the ‘Biden Rule’ to block an appointment by President Bush. It is only fair that they got hoisted on their own petard. I believe that the Democrats need to confirm Judge Kavanaugh. Their stall tactics are only creating bad feelings that will come back to bite them in the future. 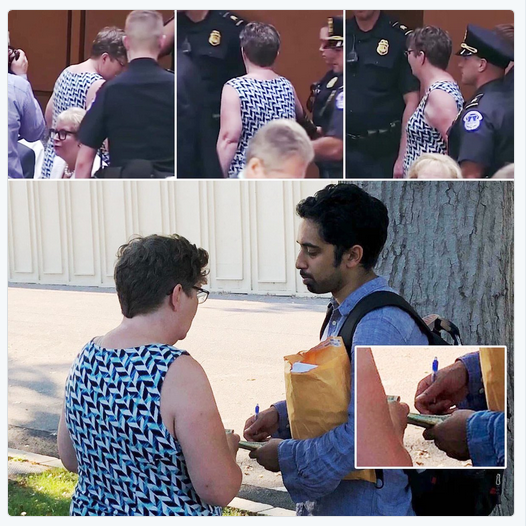 These are two pictures of a person who was protesting at the hearings for Judge Kavanaugh being paid for her protest. The pictures were posted on Twitter. What we are currently seeing in the hearings on Judge Kavanaugh is nothing more than Kabuki Theater. It is disgusting to see the process of appointing a judge to the Supreme Court become a circus. 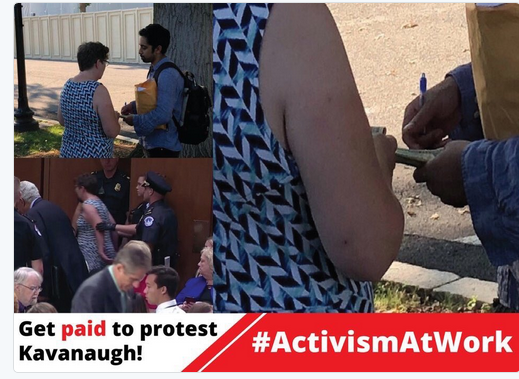 Some of the protests were so out of hand that Diane Feinstein apologized (and then was criticized by some of the more radical opposition for doing so). I hope we can complete this circus quickly. I don’t think it enhances the public’s view of our political process. Frank Gaffney at the Center for Security Policy posted an article last Tuesday about a recent statement made on CNN’s “State of the Union.” The guests on the program were chairpersons of the Senate and House Intelligence Committees, Sen. Dianne Feinstein (D-CA) and Rep. Mike Rogers (R-MI). She used some very intellectual sounding words to speak the obvious truth–the goal of Islam is a worldwide caliphate governed by Sharia Law. Unfortunately, due to the activities of the Muslim Brotherhood, there are many places in our government where it would be illegal to speak those words. Why isn’t the government telling us about the dangers of radical Islam? The answer to that questions can be found in a ten-part on-line series entitled, “The Muslim Brotherhood in America.” I realize that watching the entire series is time consuming, but every American should be required to watch the last part of the series–it is the part that outlines what we are Americans need to do to preserve our liberty. Senator Feinstein spoke the truth. Is anyone out there listening? Please listen to the entire statement from Senator Feinstein. As Senator Cornyn points out, PTSD sufferers are already prohibited from owning weapons by law. It is horribly unfair to accuse all veterans of having PTSD. Our military is well trained and can be trusted with guns. It bothers me that there are people in our government who seem to be trying to undermine the rights of veterans to buy and possess firearms.